Many readers suggested that I write about something called "ORMUS". Not being familiar with this word I googled it. 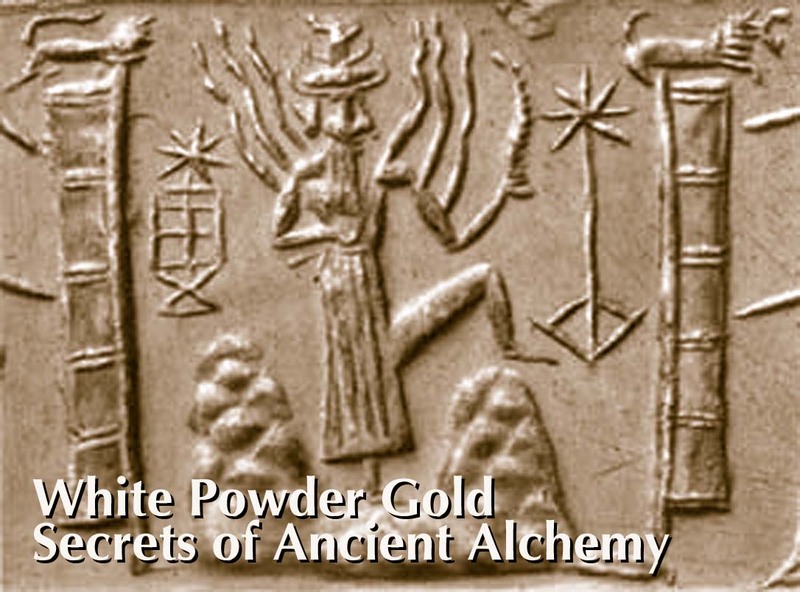 Literally dozens of websites came up, selling a white powder, made from gold, by that name. The claims sounded outrageous. These "instant karma" products are easily recognized frauds. Their effectiveness relies on taking advantage of their victim's vulnerabilities. Selling a powder that can "super size" your psychic abilities, allow you to teleport and levitate seems almost criminal. Stick with me. This story will surprise you. Your view of the universe will change. It's an amazing story that will leave you puzzled. As Hudson tells it, the soil in Texas is full of sodium and doesn't hold water very well. Farmers in that region commonly spray sulfuric acid on their land which chemically reacts with the sodium, allowing it to be leeched from the soil with water. Cotton farming on a large scale is mechanized, so Hudson had the equipment and knowledge of working with soils and acids. The first sample of the contaminated gold was sent to a lab for analysis, but they could only detect gold. The mysterious stuff could not be detected. Eventually Hudson managed to separate the gold from the other stuff and, as he puts it, "I had this sample of pure problem stuff, whatever it was." Hudson tried some experiments himself. He noticed that it would not dissolve in any acid or base and was heavy enough to drop to the bottom of molten lead. He became frustrated and sent a sample to a laboratory at Cornell University for analysis. The first results of x-ray spectroscopy were disappointing. The sample showed only iron silica and aluminum -- just what you would expect to see in a soil sample from the Southwest. But with Hudson's insistence (and money) the laboratory chemically removed the iron silica and aluminum. They were still left with 98% of the sample and repeated their x-ray spectroscopy again. This time the results were different. It's there... but it's not there! Hudson says he was amazed that none of the professional chemists were bothered that they had encountered a substance that could not be identified. They didn't share his scientific curiosity. He eventually stumbled upon the research of Russian scientists with the Soviet Academy of Sciences who had been working with a similar material. They claimed it was a collection of special atoms belonging to the "platinum group" (palladium, platinum, ruthenium, rhodium, iridium and osmium). These metals were revealed when subjected to temperatures like on the Sun -- around 5,200 degrees Centigrade -- and literally boiled away. Iron silica and aluminum boiled away quickly during the first 15 seconds. After about 70 seconds and continuing to 270, Hudson's sample was revealing significantly large proportions of precious metals: palladium, platinum, ruthenium, rhodium, iridium and osmium. At that time in history, rhodium alone was selling for $13,000 and ounce and Hudson had an estimated 1,200 ounces per ton of rhodium in his "problem stuff." David Hudson is a very intelligent man, despite often referring to himself as a "dirt farmer." He realized that something profound was happening when a well respected and highly experienced Ph.D. in Phoenix informed him that his sample had yet another anomaly. In separating a sample that had the spectroscopic emission of rhodium, he had heated and reheated and reheated the sample. Each time he kept some product for comparison. The three samples were totally different in appearance. When all three samples were sent to the Pacific Spectrachem in California they tested as three different elements: the first was iron, then silica aluminum and the last was determined to be calcium and silica -- all from the original rhodium material. How could that be? The brilliant Ph.D. was stumped. NEXT -- A New State of Matter is Discovered!